Newcastle captain Fabricio Coloccini could have been blinded when he was struck by a coin during Wednesday's 1-1 draw at Crystal Palace, according to Magpies boss John Carver. 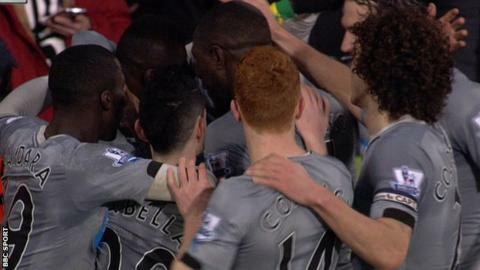 The object looked as though it was thrown from the crowd as Newcastle celebrated Papiss Cisse's goal. "It misses Colo's eye by an inch," said Carver. "Another inch and it could blind him." Crystal Palace manager Alan Pardew also condemned the incident. "That is unusual for this club because we have a great record of behaviour," he said. "I am sure we will look into it." Carver added: "What is disappointing from their point of view is that they have an unbelievable crowd here, an unbelievable atmosphere." Cisse headed in Daryl Janmaat's cross on 42 minutes before Fraizer Campbell poked in a Yannick Bolasie cross with 19 minutes left.